Gliomas are the most common malignant brain tumors in humans, constituting about 30% of all brain and central nervous system tumors and 80% of all malignant brain tumors. Gliomas are very severe human brain tumors that are rarely curable. Interestingly, these tumors are strikingly similar in dogs and humans. Moreover, gliomas occur in a variety of brachycephalic (broad, short skull) dog breeds, such as Boxers and Bulldogs—which have a considerably elevated risk for this type of cancer. Now, researchers from Uppsala University and Swedish University of Agricultural Sciences have employed genome-wide association studies (GWAS) for different dog breeds, in order to identify genes that could have a role in the development of brain tumors—in both dogs and human. 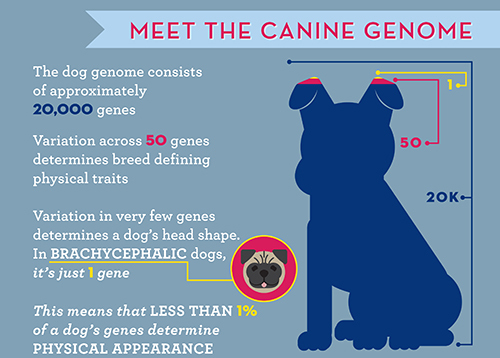 The GWAS was performed using 25 different dog breeds, allowing the researchers to identify an area in the genome that differed between diseased and healthy dogs. This region also showed signs of selection in the brachycephalic dog breeds at high risk of developing glioma—suggesting that genes essential for glioma development could be located in the same locus as genes that have been promoted in the breeding for specific traits for these brachycephalic breeds. In this genomic region, researchers also identified three particular genes as the most associated with the development of glioma in dogs— CAMKK2, P2RX7, and DENR. “CAMKK2 showed reduced expression in both canine and human brain tumors, and a non-synonymous variant in P2RX7—previously demonstrated to have a 50% decrease in receptor function—was also associated with disease. Thus, one or more of these genes appear to affect glioma susceptibility,” the authors wrote.